Are the stabburs (¿cómo se hace el plural?) always that decorated? ¿cómo se hace el plural? In Norwegian? Stabbur is a strong neuter, so the indefinite is the same in plural (ett stabbur, to stabbur). The definite plural depends on dialect. The written forms are stabbura (Nynorsk and “radical” Bokmål, i.e. conservative) and stabburene (“conservative” Bokmål, i.e. innovative). A well illustrated structural analysis: a great post indeed. I also liked the side-kick to Viollet-le-Duc. 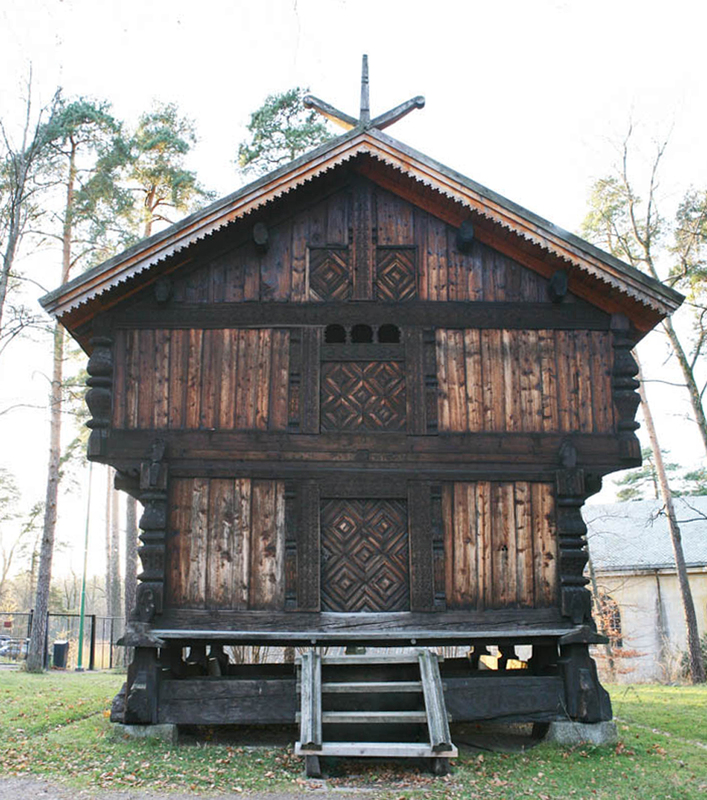 The Rusyns in Slovakia and Hungary have wooden churches of a similar structure. Here you can see a good overview in English with several photos. At my job we used to have a book on tree structures with a very interesting article on the structural system of stavechurchs. I couldn’t find it there, nor here at home (so whoever took it it wasn’t me!). The roof frame and elements like the crossed banister here keep the posts together, the roofs and walls keep them straight, and the corner ornaments add some stiffness. Notably, according to the modern-day structural norm, the snow load is zero when the roof is steeper than 60­°. Oh,Trond, that’s interesting, first of all the book, but also our own (a.d. 1923) house which has bearing walls of compressed earth (stampet jord) is an unusual structure. The roof is 60 °, which is quite unusual around here. I now realise the Swedish structural engineer who designed it must have made it so steep so that he could eliminate the potential problem of the snow load. Mr Studiolum, thank you very much. Yes, I couldn’t imagine what they thought they were doing, but then I suddenly thought of Viollet-le-Duc. I’m very grateful for the link, which has lots of information and great pictures. I will peruse it all at my leisure. Gracias, Julia. I’m glad Trond was here to give you a proper answer to your question! They are often (not always) decorated with carving, and always have that form. I’ve got some more pictures of some stabbur(s) with carving; they are round the corner from where we live and I’ll show them in a little while. 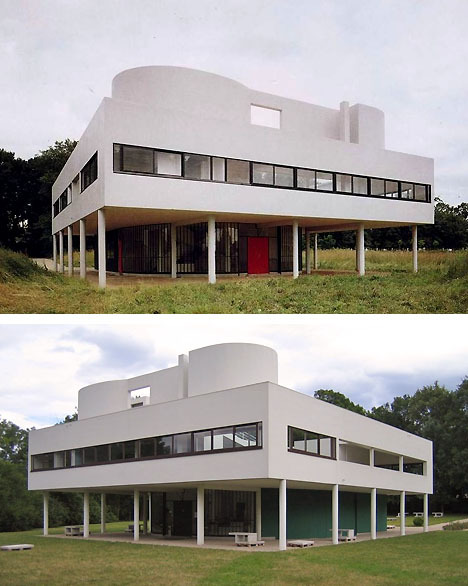 Amazing buildings! I am intrigued by the heads at the top of columns in the second floor of the church (and therefore meant to seem slightly higher than human size, but not much, much taller. They remind me of similar columns found in the open in other places (I think Northern Eurasia and some places further East). Were such columns a feature of Norse art? Yes, I see what you’re talking about, they’re in the sepia drawing. I don’t know, it’s not really my field, but perhaps Trond does, though..? Well, the book would have been more interesting with the book. Now I had to fill in with my own ad-hoc analysis between the half-remembered pieces. But if it turns up I’ll scan the chapter and send it to you. m-l: I am intrigued by the heads at the top of columns […] Were such columns a feature of Norse art? 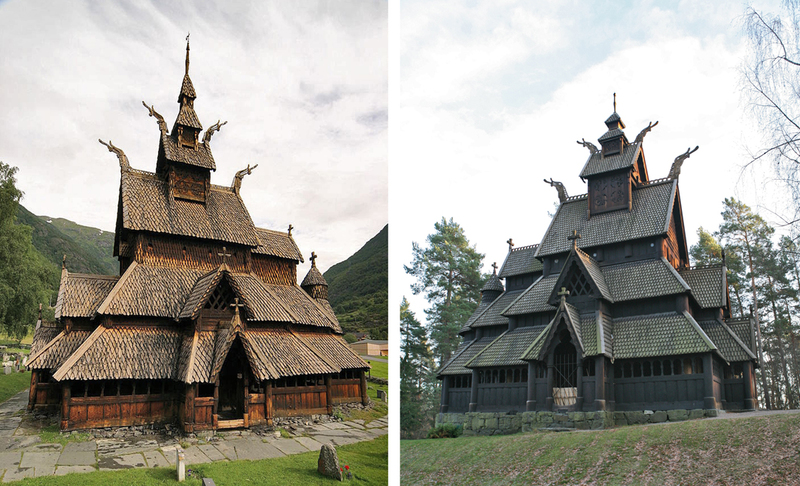 These churches are medieval, and it’s rather the other way around: Much of what is popularly imagined about Viking art is inferred from them. And not necessarily correctly. 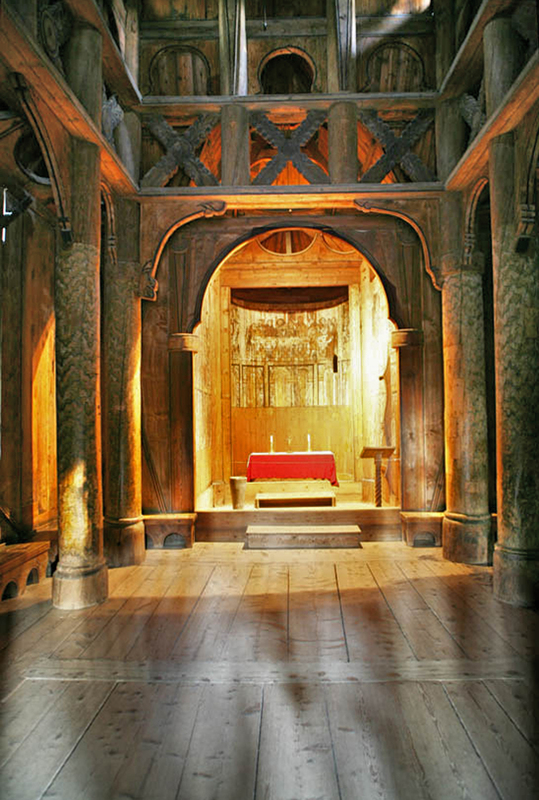 Larger stave churches like these are adaptations to timber of the contemporary styles in stonemasonry, and the heads are inspired by column capitals. They may also continue a local tradition, of course, in the craft and in the taste in decoration. I don’t know, it’s not really my field, but perhaps Trond does, though..? I tried. But be aware that as long as I don’t say so explicitly, what I say is not ex cathedra. Thank you, Trond, very informative! And thank you, AJP, (we’ll be waiting for your other pictures)! Great pictures, and Studiolum’s Rusyn ones too. Do I detect some influence from the Scandihoovian Rus? The Danish churches I saw, and a lot of the homes too, had a ship hanging from the ceiling. Do I detect some influence from the Scandihoovian Rus? 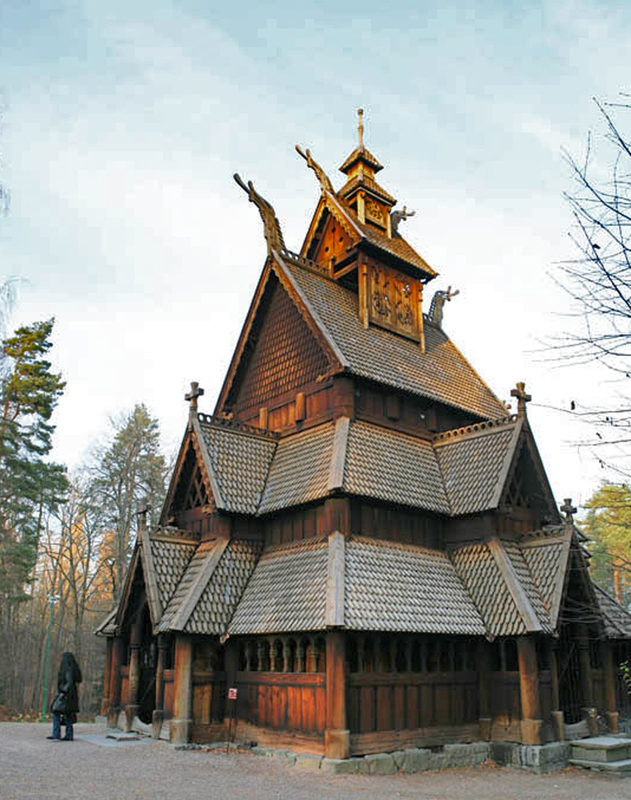 It would be tempting to say yes, but they are rather a crossing of two different traditions of medieval wooden churches, from Russia and from Hungary, which were the “translations” from stone to wood of Byzantine and Gothic churches, respectively, just like Scandinavian wooden churches were of Northern Gothic church structures. Half of my family – my mother’s lineage – is Rusyn from the eastern borders of Hungary, and they also had a beautiful wooden church like this. Accidentally, when they moved to the capital, the church “followed them”, as it was brought to the open air folk museum, quite near to where I live now. Beautiful! Dumb question: are these Protestant churches? 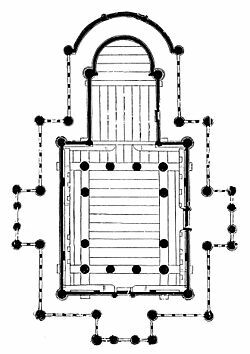 Early Russian churches are similar. First they had spires and then got the onion domes. Not when they were built, obviously, but I suppose they are Lutheran now – the ones that are still consecrated, and that would be most of them, I guess. This one was moved because it wasn’t any longer big enough to hold the growing congregation, but I don’t think that situation occurs nowadays. I didn’t know the onions were added later, I’ll have to look that up. I’ll check them out, this was one of my favourite themes when I lived in Hamburg; in the old dock area called Speicherstadt there are some old roofs that look like nazi helmets. I wondered if that was where they got the idea ( the helmet idea, not the nazi idea). And then all the Hamburg architects started putting hats on their new buildings and we made fun of them (drawings with the Keiser’s helmet). Here are a couple more wacky joker helmets. Oh, I LOVE the Novgorod one, it looks like a platoon of toy soldiers wearing gold and silver helmets and holding white shields. What a wonderful description, Mr Crown! I think that’s EXACTLY what the architects and church fathers wanted to convey. Can you imagine the impression the cathedral made about 800 years ago, when all the houses were one or two stories? It must have been like coming across some massive white giants in the forrest. Massive and scary, but also cute. I suppose they are Lutheran now – the ones that are still consecrated, and that would be most of them, I guess. my mother’s lineage…is Rusyn – Are they the architects? Yes, that was one of the things I loved about BA (and later ab0ut NYC). Mongrelism forever! Mr Studiolum, did your mother’s family call themselves Rusyn? Yes, they did. They belong to the Dolishnyan or Dolinyan (=“lowlander”) subgroup (see the map here) which, in difference to the Lemkos, Boykos and Hutsuls, never called themselves like this, but simply Rusyns (while calling the other three groups by their proper names). AJP: The walls are independent of the structure. 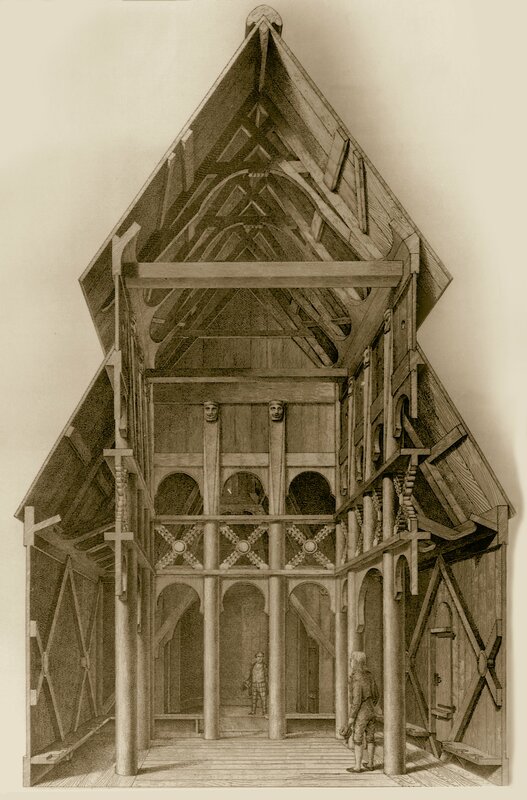 Incidentally, Viollet-le-Duc wasn’t the only one to modify Notre-Dame de Paris: some people put a little roof over its -o, just like in the name of a famous (landscape) architect. Roof-wise, I love the shingles on some of these stavkirk(-e, -es, en, -what-not-as-plural-marker). Each one of them is a little jewel instead of the ordinary rectangular piece of covering timber. Thanks for that, Sig. Perhaps you or Marie-Lucie would help me out about the hat. It says in the French wiki-dictionary that it is archaic. I think I used it because of the Latin noster, but it pays to check foreign words before you write them in front of a bunch of linguists. The shingles are no longer used in Norway. I can’t understand why not. In New England, for example, they are so standard that The Shingle Style is the title of a famous treatise by the late & great Vincent Scully. I would like to replace the metal roof on our house with cedar shingles; shingles have to be replaced occasionally I suppose, but it’s worth the extra trouble in my opinion. Had I been a structural engineer, I probably would have remembered to say that frame structures like post & beam are susceptible to wracking. 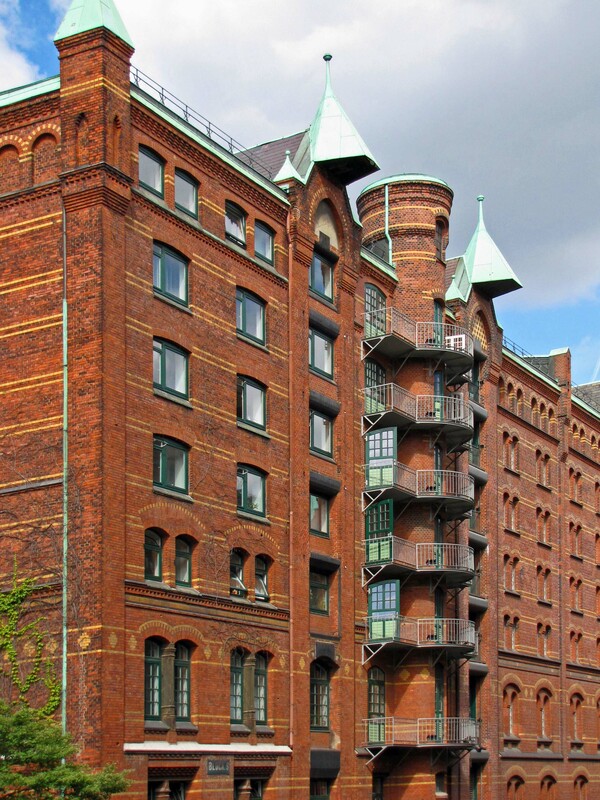 I even know the German term for a stiffening wall – Aussteifungswand – because we had to add two to a building with a concrete frame that we did in Hamburg. 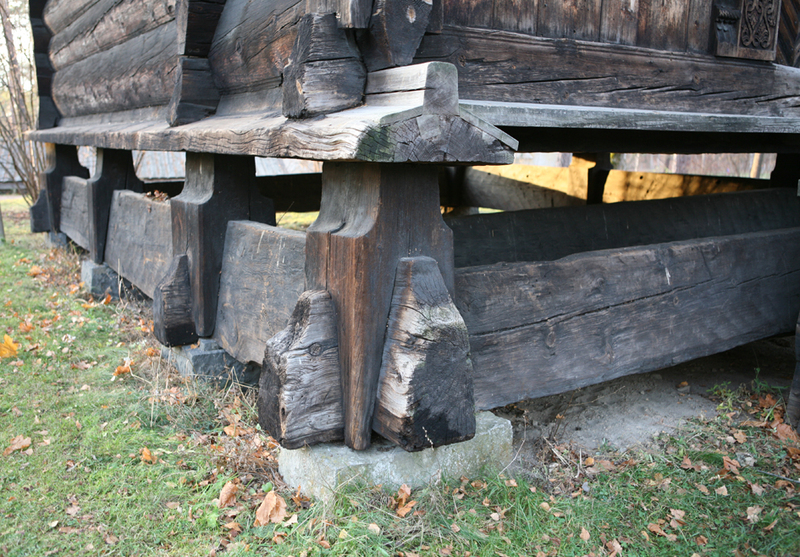 One thing I wondered about is the effect of those very sophisticated-looking joints – you can see one at the corner of the stabbur – don’t the beams become continuous rather than simply-supported and in that case isn’t there crazy shear stress near the columns? I’m not sure what skidding is in the context of structures, probably due to my own ignorance. Siganus is right when he says that the walls provide lateral stiffness. Or at least that’s how I read the structure, too. It’s what I meant by my too short the roofs and walls keep them straight. I’m now pretty sure that the book I was thinking of is Petter Aune: Trekonstruksjoner, del 2, Tapir 1994. I was originally almost certain it was Aune, and when I found his book at work, with nothing about stave churches, I was confused. But there’s a part (del) 2 that I didn’t find. Of course there are no earthquakes in Paris. As there are no earthquakes here. Since design for earthquakes became part of Norwegian building codes a decade ago, with the gradual adaptation of Eurocode, the whole business has been confused over how to deal with it. “Wracking” is the three-dimensional deformation that you get in a frame when it isn’t stiff enough. Trond, do you know why wooden shingles aren’t used in Norway anymore? Ten years ago I saw a new house in Nesodden covered with cedar shingles, that’s the only contemporary building where I’ve seen them used. I’ll look out for del 2. In Canada, cedar shingles are often used to cover outside walls, but for a roof that use is pretty much limited to small constructions such as garden sheds. Large shingles were used for roofing in West Coast native houses though, before European arrivals. (“Cedar” in this case does not refer to the famous trees of Lebanon but to species of Thuya native to the West Coast). I think Larch is also used to make shingles. I didn’t know that about cedar, m-l. Which kind is it that is used to keep moths out of clothes closets? It has a lovely smell. There are two words in classical French (which I speak): notre and nôtre, both from Latin “noster” (and its various forms such as “nostra”, etc). The first one is used before a noun, as in *Notre-Dame* ‘Our Lady’, the other one is not, as in *Lenôtre* meaning literally ‘ours’. The “hat” is not just to differentiate the words as written but reflects a different pronunciation. I say ‘classical French’ because current pronunciation among young Parisians is now greatly simplified from what I grew up with (because of the mix of populations in Paris), and that simplified pronunciation is now described as the norm in some current books. That simplification means that many people cannot rely on their own pronunciation to know where to use the “hat”, and some spelling reformers (who no doubt themselves use the simplified pronunciation) have decided to get rid of it in some cases. When I see members of my family in France I listen carefully to the way they speak, and I have not noticed my younger relatives, even the ones living in Paris, using the same pronunciation for words like notre and nôtre where I pronounce them differently. Around here we have Eastern Red Cedar. It is the prominent local tree in the coastal area where my family go(es) when we can. I knew that it was not a true cedar but a juniper. It does not grow big enough or straight enough to serve as timber, but it is rot-resistant and makes good fenceposts. It has a strong aroma, and I just read on the net that it has actually been successfully tested as an agent against clothes moth larvae. The area is also one where cedar shingles on houses* (side, not just roof) are very traditional — but that’s a different plant, Western Red Cedar. As m-l says, the latter is a kind of Thuja. The thujas and the junipers are both in the cypress family, so not close kin to the Cedars of Lebanon. *The house of the squirrels-in-the-chimney and osprey-in-the-porch tales is covered with ’em. Which kind is it that is used to keep moths out of clothes closets? In that States, that’s the J. virginiana to which empty refers. There was a large cedar closet in the house I lived in (in the Midwest) as a boy. I imagine if you go further south, it would be J. mexicana (Texas cedar / Ashe juniper), but I don’t know that for certain. Very interesting, Studiolum. Even tho I’m half Lemko, it’s hard to keep track of who was called what when and by whom. I have a half-Lemko, half-Boiko friend in Moscow who tries to enlighten me. But so far I’m a poor student. 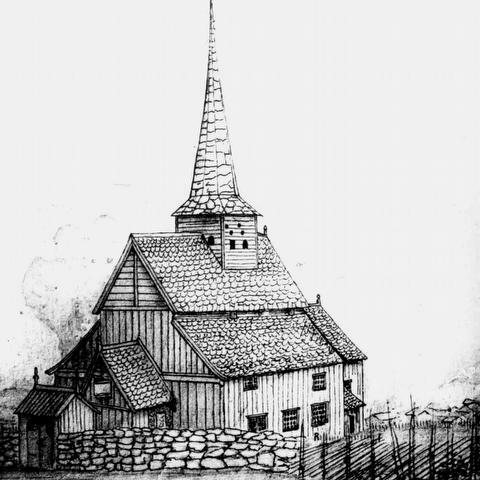 Trond, do you know why wooden shingles aren’t used in Norway anymore? They are used. Just google ‘takspon’ or ‘takflis’, and you’ll see. But nowadays they’re mostly used for restoration. I think it’s usually made of heartwood of pine. I think spon was mostly used for outhouses (and other cold buildings like churches), while never “birch bark” was preferred for heated buildings. The watertight never was weighted down and insulated by a layer of grassturf, making the characteristic torvtak (sod roof). flis “wooden chip; ceramic tile; flagstone”. Juniper (einer, brisk, brake) was used for walls as in Havråtunet outside Bergen. The article hints that it may have been a recent innovation, maybe from the late 19th century, when the forests were over-exploited and the juniper was the only tree that resisted grassing sheep. Arthur, this is a word I haven’t heard (yet) in construction. Does it have anything to do with buckling (“flambement” in French)? — i.e. the often catastrophic failure undergone by a member in compression when it is too slender for a given load (or, which is the same, when an applied load is too great for its slenderness). Skidding: As Trond guessed, I was referring to sliding on the ground/stone support. Didn’t you say to me that these churches, or some of them, were just resting on their stone supports? In that case it’s hard to understand how lateral movements are restrained, as Trond said due to horizontal deformation possibly due to gravity loads, but also to the horizontal loads themselves (chiefly due to the wind). If the timber structure is very heavy, then maybe the friction (ratio of vertical forces over horizontal forces) would be enough to resist the tendency to slide, but I’d think that this is a fairly risky approach. Shingles: The (imported) ones that are more often used here nowadays are made of kempas, sometimes wallaba or ironwood. In nearby Reunion Island they used to make good shingles with a beautiful endemic tree: the “Tamarin des Hauts”. Notre église = our church. C’est la nôtre = it’s ours. So it’s “notre dame”, our lady. I don’t pronounce the two words the same way and I don’t personally know anybody who does it. I certainly don’t pronounce the words the same way, and neither do any members of my family that I know of, but people from Southern France (where Occitan used to be spoken by the population) do, and they are one of the influences on the simplified pronunciation of contemporary French. Trond & Sig, thank you very much. Now I can say shingles in three languages. Maybe we can use them on our roofs here &/or in the mountains in Gudbrandsdal. Yours, Sig, are quite dark grey, almost like slate. No, not buckling. Wracking is what happens when a rectangular frame loses its 90 degree corners. It’s caused, for example, by a lateral load when there’s no X-bracing: the columns are not perpendicular to the ground any longer and the frame becomes a parallelogram. I’ve wracked my brains for a better, structural engineer’s, word, but I’m not sure what it would be. Skidding … I’ve never heard of a Norwegian building being shifted sideways off its foundations, although I know that’s the commonest cause of small buildings collapsing in earthquakes. So either the winds aren’t strong enough or there’s a connection between the wooden post and the stone footing. But, if you look at the post in the bottom picture, its not a visible one. M-l & Sig, thank you so much for the notre/nôtre explanation. Now all I need is to hear the difference. In the first one, the vowel is similar to the one in English not, while in the second one the vowel is similar to English (British) nought. Really? I’ve always said the second one with a vowel much more closed than the o in nought — more like that in note (but of course not diphthongized as in English).